Communication has been difficult to impossible since we arrived in Magadan. The heart of the problem has been the Russian phone system. E-mail depends on a reliable clean phone connection, preferably designed to handle data at reasonable speeds. In the case of Eastern Siberia, the preferred e-mail phone connection seems to be SprintNet. There was no SprintNet local access number in Magadan. To use SprintNet from Magadan, we needed to call long-distance to Vladivostok, Khabarovsk, or Yakutsk. All three of these cities in the Russian Far East have a SprintNet access line. 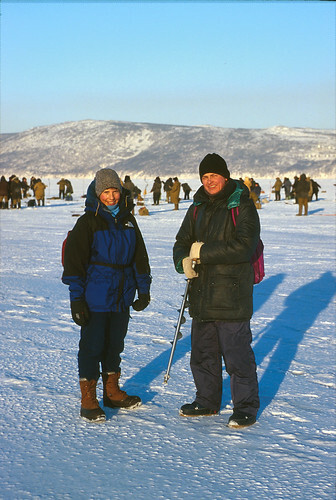 Mariy Gorodinskiy had spent much of his life as a geologist in the Russian Far East. We rented his extra room and shared cooking. He was a great introduction to Russian people. Unfortunately, making a long distance call from Magadan is often like talking between two cans connected by a string. We tried numerous times to find a connection without success. Neither CompuServe nor GlasNet could be accessed from Magadan through our Macintosh laptop, and once we left Magadan, phones were all but non-existent. Many of the most educated and worldly people had no understanding or concept of e-mail. Fax machines were at the top of the communication ladder, and a weak phone system made them difficult at best. To make a long distance call out of the country, you have to place an order with the operator and sometimes wait as much as two hours for your call to go through. Almost overnight, the bay encompassing the Port of Magadan has been completely closed in ice. Temperatures down to -33 °F (-36 °F) have set seasonal low records. Cold winds swirled the dry snow, reducing visibility to zero at times. We are shocked to see how quickly the weather here can change. Driving is treacherous. The slightest gust of wind can create total whiteout conditions. 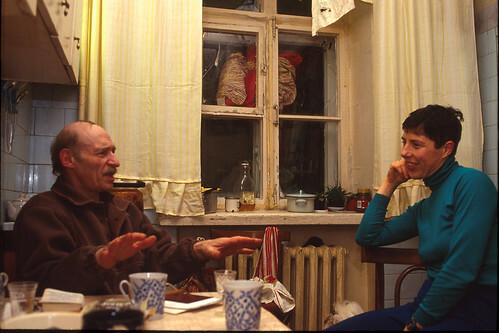 Mariy Gorodinskiy spoke little English, and we even less Russian, but we spent many evenings sitting in his cozy kitchen having great conversations. Language isn’t everything. Since our arrival in Magadan, we have stayed with Mariy Gorodinskiy, a man of 67 years who has spent much of his life as a geologist in the Russian Far East. 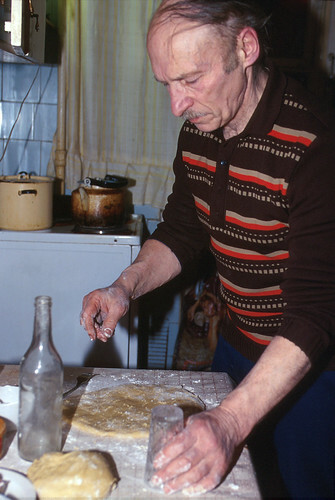 The little English he spoke from his worldly travels, combined with our few words of Russian and a good dictionary, allowed us to spend many evenings sitting by the fireplace in his cozy kitchen, learning about the area and life in Russia. 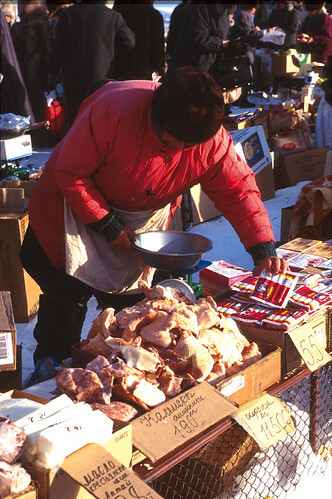 Frozen chicken and hot dogs from the U.S. were common items in the street markets. Instant mash potatoes and pasta were also winter staples. It seems to be the custom to drink vodka with dinner, and this too helped to break down the cultural barriers. He prepared Russian dishes for us, and we reciprocated with the limited ingredients we could find in the stores and street markets. Frozen chicken legs and hotdogs from Alaska were common. Ice-cream cones sat in the open. At –30°F, only the eggs were kept in insulated boxes to protect them from freezing. Fresh fruit and vegetables were a rarity. The rusting crane lowered our container onto the oil-soaked gravel outside the custom’s guard shack, releasing it with a resounding thump. Having started the previous week on our paperwork, we formally decreed Magadan the rubber stamp capitol of the world, surpassing even Cartagena, Colombia and Caracas, Venezuela. Our interpreter and expert customs navigator, Yuri Koudlay, maneuvered us from office to office and stamp pad to stamp pad with the defiance of a matador fending off a herd of Sunday bulls. He discovered a new and little known regulation which will allow us to keep the truck and support trailer in Russia for one year without paying import taxes. Interestingly enough, since we arrived by plane, the truck and trailer were not in our passports. After three years of planning, we stood on the docks of Magadan’s dilapidated harbor, the frozen Sea of Okhotsk as a backdrop. Ice breakers cleared a path for the FESCO ship Anatoliy K.. 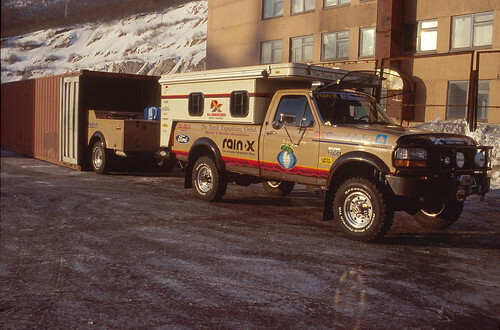 It had taken 29 days to reach Magadan from Tacoma, WA. A light snow dusted our parkas as we watched the giant crane, like some rusting prehistoric praying mantis, lower container 143236 onto the oil-soaked gravel outside the custom’s guard shack, releasing it with a resounding thump. The Turtle IV had survived the trip, and except for reinstalling the vent, racks, and storage boxes on the camper, we were ready to roll. Unlocking the steel doors, we cut the customs seal and swung them open. The restraining ropes had held!!! 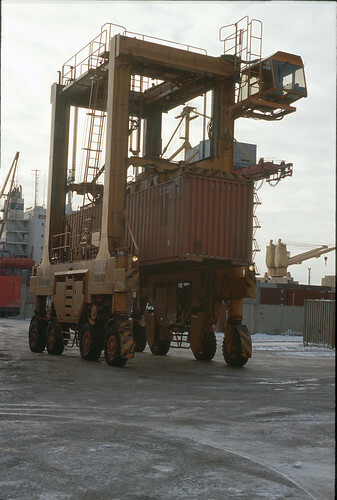 The temperature inside the container was -27 °F, but the big International turbo diesel roared to life on the first crank. From experiments in California, we knew the gear oil in the differentials had turned to a jello-like putty. Even the transmission shifted like a stick in heavy cement. The suspension was stiff as we crawled up the pot-holed road from the port. The springs creaked as they regained and flexed their arc. The Turtle IV had survived the trip, and except for reinstalling the vent, racks, and Packasport storage boxes on the camper, we were ready to roll. Perhaps the real challenge was just beginning. Tires squeaked in the powdery snow. We were driving in Russia and headed west!! Where the tide had broken the edge into large slabs, we had to hop across open water, but out on the bay, the ice was about 10 inches thick. 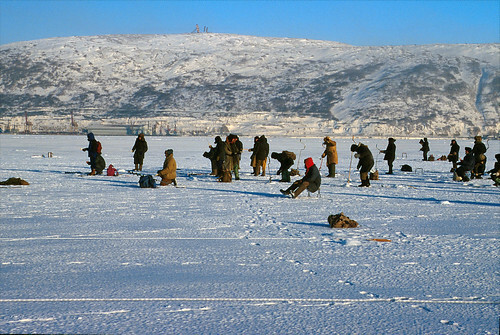 Ice fishing is a Russian passion. It’s a time for men to socialize and talk about their problems, and it’s also a means of putting food on the table for families who may not have seen a pay check for months. With the help of Sam Taylor and the friendly people at N C Machinery, Caterpillar service and parts distribution center in Magadan, we wereintroduced to Mizin Michael, Chief Engineer at Indigirzoloto, a local trucking company who sent a convoy west every week or so. They stopped overnight in Susuman (148° 08′ East, 62° 46′ North), and continued to Ust Nera (143° 12′ East, 64° 34′ North). We weren’t too anxious to convoy on the one hand, but everyone we spoke to warned of the danger in traveling alone. We wondered if it could be so bad. Patiently sitting over an ice hole in -35°F temperatures will make a real fisherman out of anyone. Russians are avid anglers. A special ice bore was used to make an 8-inch hole, and something like a small shrimp jig was used for a lure. The “pole” was only 12 inches long. Now we waited for word that the convoy was ready. 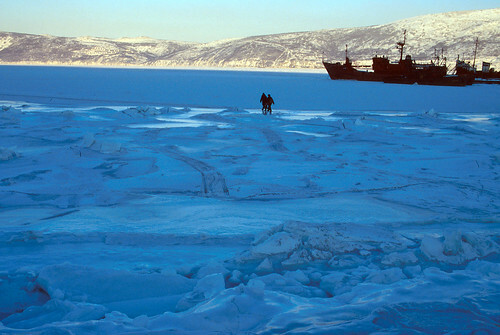 The ice on the Bay of Nagayeva, which contains the Port of Magadan, continued to thicken. In the company of a Russian friend named Alexei, we hiked about half an hour out to the middle of the bay to do a little ice fishing. Where the tide had broken the edge into large slabs, we had to hop across open water, but out on the bay, the ice was about 10 inches thick. 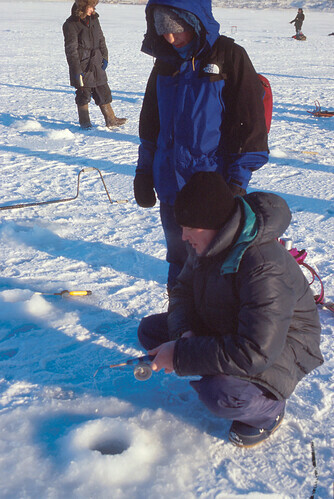 A special ice bore was used to make an 8-inch hole, and something like a small shrimp lure was jigged up and down. The “pole” was only 12 inches long. Fishing was not great, but the experience was interesting. We were learning what a passion fishing is in Russia, and perhaps a valuable way for them to put food on the table which otherwise could not be afforded. After several days of waiting and an unbelievable amount of bureaucratic procrastination, we were finally able to get a three-month extension on our visas, just in time for our departure. Magadan felt safe now, and we were enjoying the company of new friends. A young couple invited us to dinner, and we learned how to make a traditional Russian dish called pilmjeni. The young man gave us a small ivory carving of a mammoth, and his father-in-law presented me with a gold nugget. He cautioned not to tell anyone, because it’s illegal to possess such a find. All gold belongs to the state. As I reached to shake his hand, I learned my first lesson in Russian etiquette. Never shake hands across a door or window opening. Bad luck! It was 2:00 AM when the party ended, and our hosts walked with us through falling snow all the way back to Mariy’s apartment, another Russian tradition. Now that the hassles are behind us, it will be sad to say good-by. 4th km of Armanskogo Hwy.